Have you ever gone through a phase when you love to wear a certain color? You know, like Kim in her white phase and Adele in black? That has been me lately in all shades of blue! 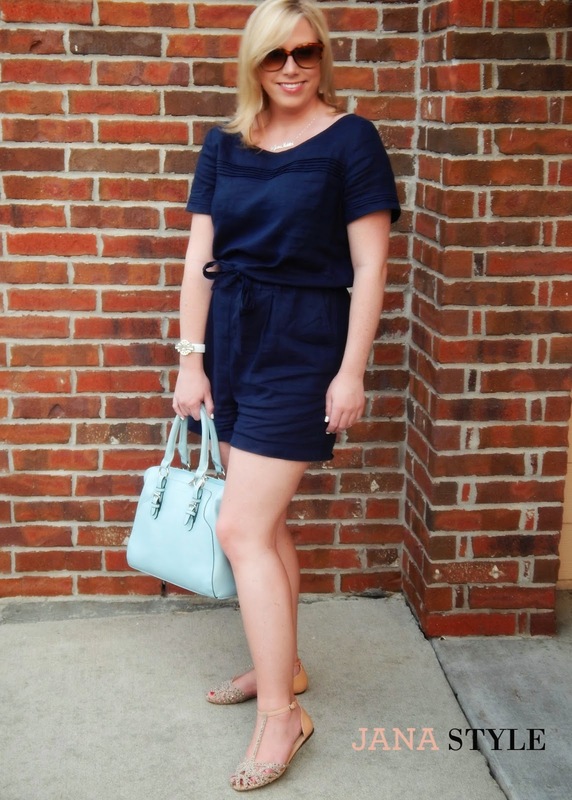 I picked up this cute romper at Loft a few weeks back and it has been a go-to for those mornings when I'm running a little behind and need something quick to put on for work. Its super easy to wear and is so comfy. The only downside is it's linen which isn't my favorite, but the comfort and cool fabric makes it worth it. 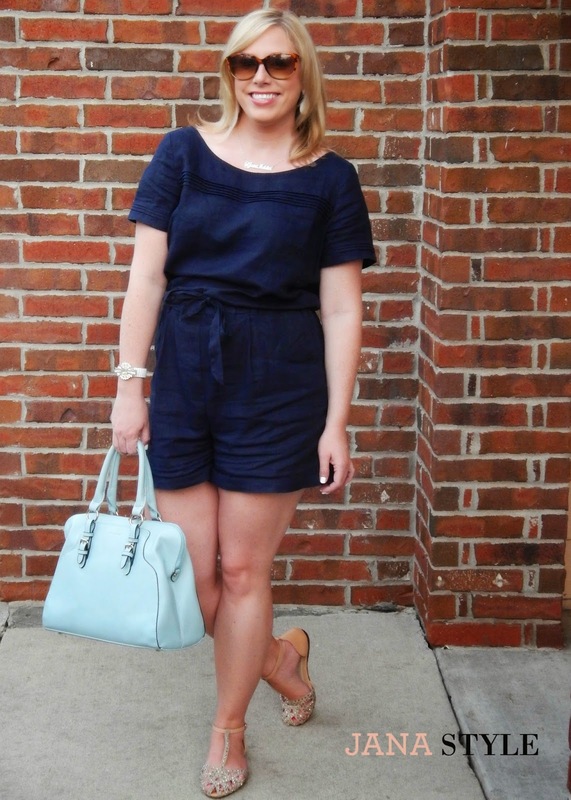 So far this summer, this has been the only romper that I have found that I have really liked. I am on the hunt for a couple more! They are so cute and it's a good switch up from the usual dresses I wear all summer. I just joined the romper club this week! Bought my first one from Urban Outfitters :) Those shoes are adorable. Thanks Jessica! I bought one from Urban Outfitters last week that I saw Lauren Conrad wearing and I love it but its the wrong size. Hopefully I can get it exchanged :) They all fit a little different so it can be hard to find the right one! 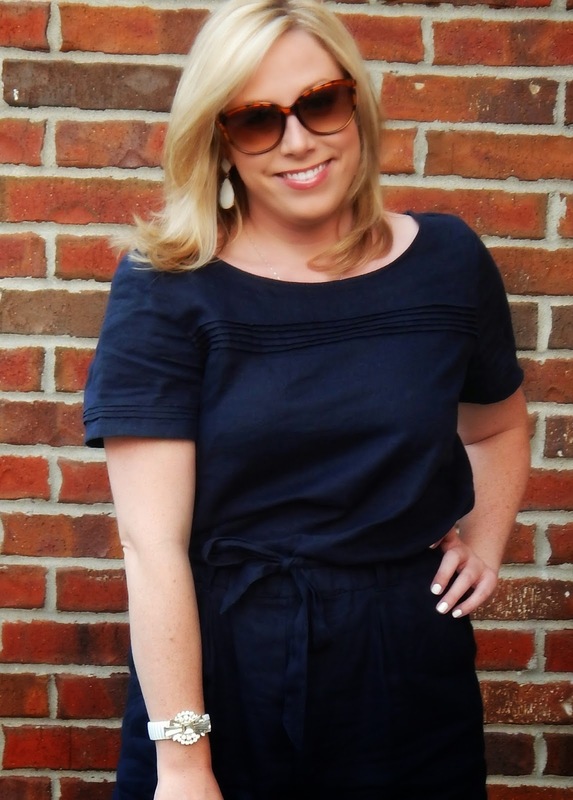 This navy color is so pretty- and a little unexpected in romper form. Love it! It's really good against the baby blue bag, too. :) Happy Thursday, Jana! I love rompers, but haven't been able to find one yet that fits me right. I want to give this one a try, though! It's so cute and looks really comfortable. I know what you mean about getting into color phases. I'm in a peach phase right now:) Hope you're having a great day! Finding the right one I think is the hardest part about it! I love them though! There a ton of cute ones on the internet but I want to try them on so that I know they fit right. Let me know if you find any! :) Have a fabulous weekend Kari! Oh man, I sure wish I had the confidence and cuteness to rock a romper like you! You looks so adorable in that Loft number!